From the moment I initially saw the trailer for The Favourite, I was hooked. After sitting through an unreasonable amount of dull, humourless period pieces over the years, I was so excited to see three of my favourite actresses together onscreen for some absurdist fun. And as a side note, I wasn’t feeling hampered by worries surrounding historical accuracy – filmmakers taking liberty with this has never really bothered me. So inevitably, there was a split second when I sat down in the cinema to watch it where I was hit with the palpable fear of the film not living up to the hype. Fortunately, within five minutes of the hilarious opening, I was once again hooked. The Favourite has a refreshingly simple plot: Sarah Churchill is Queen Anne’s current favourite (professionally, romantically, and sexually), until the recently impoverished Abigail arrives to shake up the power structures and claw her way back up to a respectable position in English 18th century society. Despite, or perhaps because of, the farce of it all, I was highly invested in basically every character’s struggle for control. Though some elements of their characters may border on the ridiculous, and this does give you the opportunity to effectively look more critically at the film, you never feel too distanced from their tragedies, both in and before the current story taking place. Though in all likelihood this will sadly not happen – though neither will Toni Colette winning, so a girl can dream – I really wish all three leading ladies could win big at the Oscars this year. Colman is wonderful, giving the best performance of her career so far as a fantastically tragic figure dressed up in infinite layers of bizarre decadence and delusion. At one point during a scene, I was laughing at and almost crying for her Queen Anne simultaneously, empathizing with Colman and Lanthimos’ creation more than I ever fathomed I would. As for Weisz and Stone, each of them lent so many layers of humour and pain to what could have been wholly cruel characters that they deserve all the accolades they have received. In true Lanthimos style, the film’s visuals revel in long takes and strangely low angles to convey how uncanny and displaced the whole world of the movie is. Political struggles and romantic rivalries may abound, but not as you know them, and this oddness is paradoxically what brings such an intimacy to the proceedings. Of course, this is all assisted by the brilliant screenplay, which is endlessly clever and quotable in light of its intentional awkwardness – for anyone expecting a straightforward period film, phrases like ‘c**tstruck’ are likely to throw you off. It’s also fantastically refreshing to see a successful film like The Favourite depicting lesbian relationships in a historical context, and particularly with such non-exploitative visuals. At no point are we shown two impossibly attractive women in a ‘friends with benefits’ situation writhing around naked whilst never taking their affair seriously. Instead, the main dynamic of the film is the relationships between the three leads, as they grow, change, shatter and recoup. Lanthimos, in his own surreal way, takes these romantic and sexual connections seriously, and you don’t get the sense that they exist to titillate a male audience; these women are powerful and will conduct themselves as they please. The Favourite may be a movie about lying and compromising yourself to reach the top, but the lesbian relationships always maintain a level of sincerity. 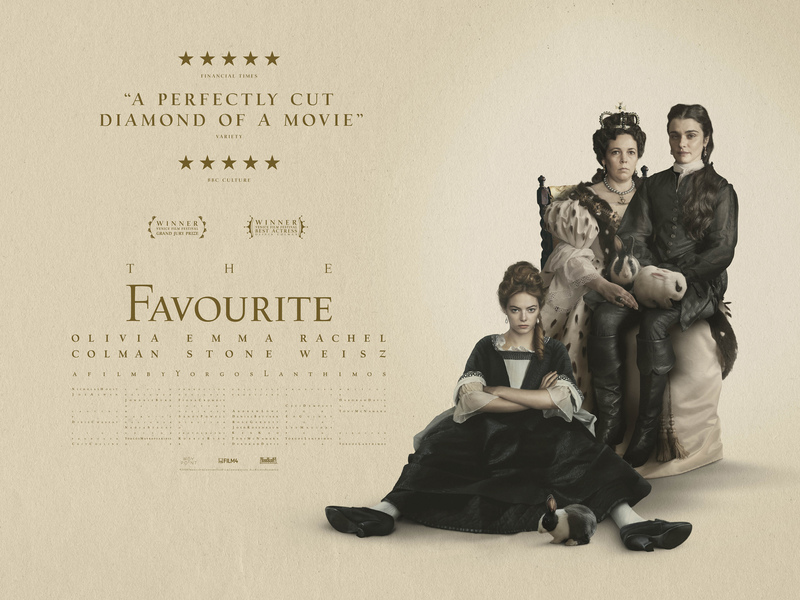 Perhaps the best film of 2018 amongst many great options (or in the case of fellow English people without festival access, the best of 2019 so far), The Favourite is Lanthimos at his best, and period drama at its most inventive. Mary, Queen of Scots is certainly going to be at the mercy of some comparisons, and though I haven’t seen it yet, I already don’t envy it for going up against this.